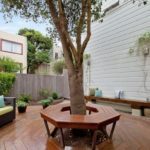 Everyone knows that wood is a great material for adding warmth to spaces and for making them feel cozy and welcoming, all without minimizing their elegance. 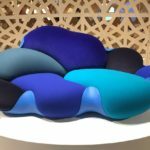 The question that naturally results from here is how could or should you use this material in your own home’s interior design and decor? 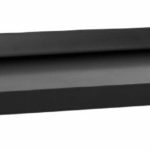 One of the options is related to walls, more exactly to wood wall accents or anything that basically puts this material up on a wall. 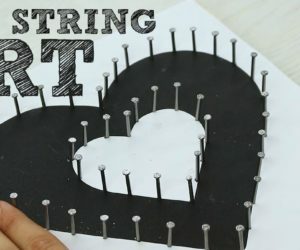 We’re always better at understanding things by looking at examples rather than just talking about them so we’ve prepared a bunch for you to check out as well. The Stone Wall Fish Camp is a complex of lake houses situated on the edge of Lake Martin in Alabama. 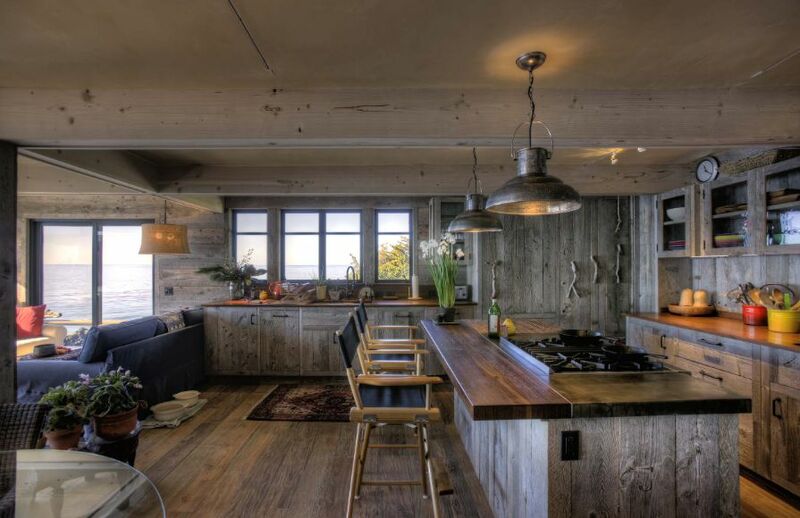 They were designed by Jeffrey Dungan Architects in a rustic style and they try with their design to capture and to maximize the tranquil and relaxing ambiance which defines this whole area. The topography and the views served as sources of inspiration for the interior and exterior design of each lake house. 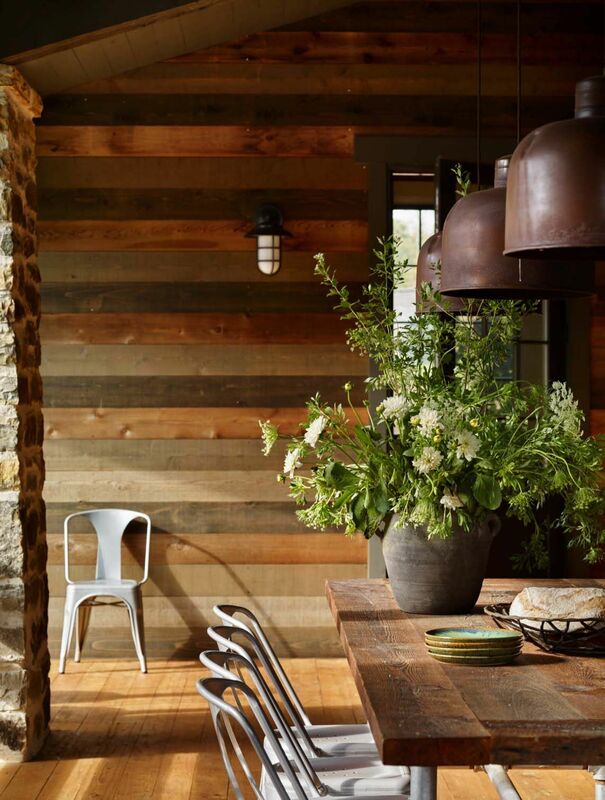 We’re particularly interested in the interiors, more exactly in the wood wall panels which were used here to create a rustic and warm atmosphere. All this wood looks beautiful in combination with stone and metal. 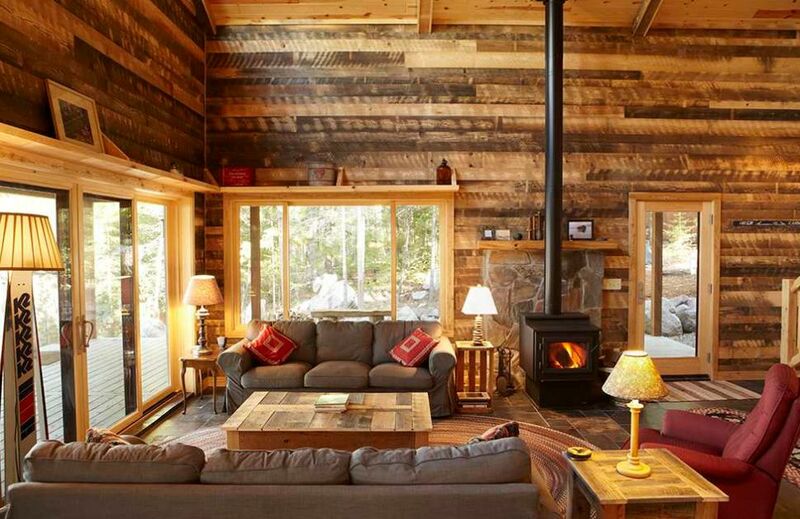 This rustic house from Jackson, Wyoming has a very interesting story. Its exterior is made of stone which comes from what used to be a Hutterite dairy and milking station back in the 1860s-1880s. The structure was disassembled and then moved here where JLF Architects collaborated with Big D Signature to create this rather charming home. 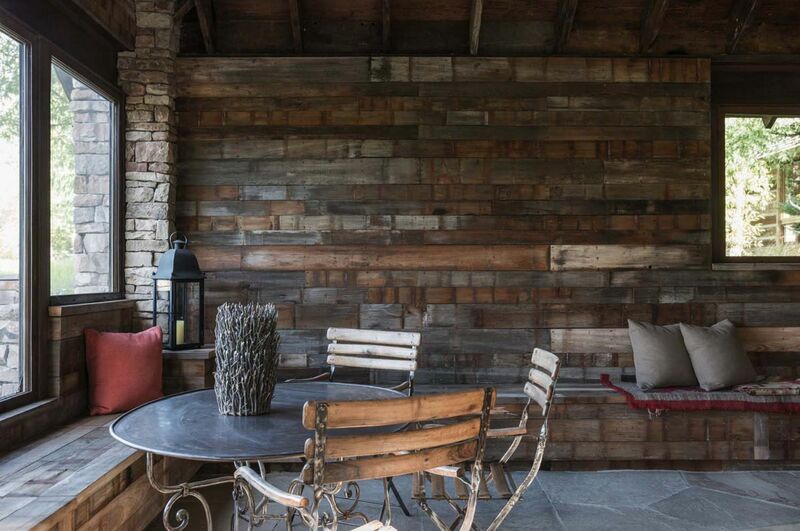 The weathered stones give it a lot of character and the wood walls give the interior a very cozy feel. 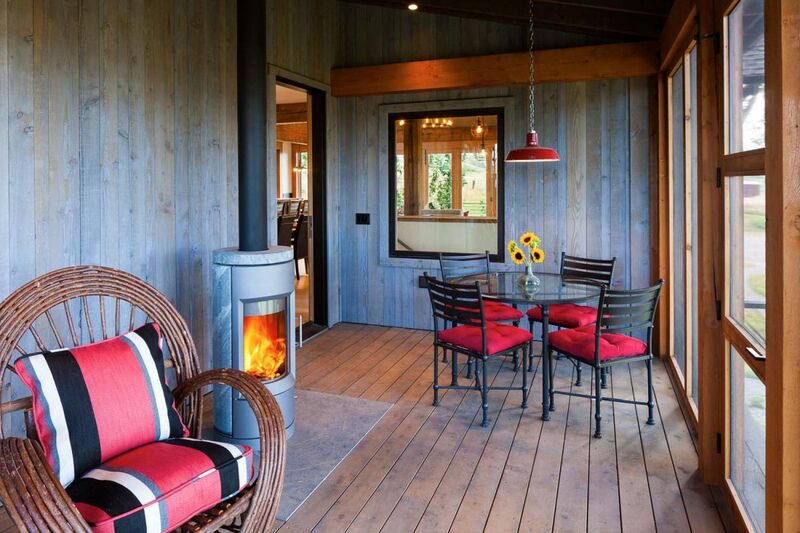 The Lazy Heart Ranch is a beautiful and inviting residence located in Bozeman, Montana. There’s a lot about it that we like, starting with its position on the site, the orientation and the fact that it makes the most of the views and the landscape which surround it. The ranch was designed by Brechbuhler Architects who used a palette of simple and pure materials intended to connect the structure to its surroundings and to establish a strong relationship between the indoor and the outdoor. A flagstone walkway leads to the entryway and inside you can notice a lot of wood being used throughout, including on the walls. 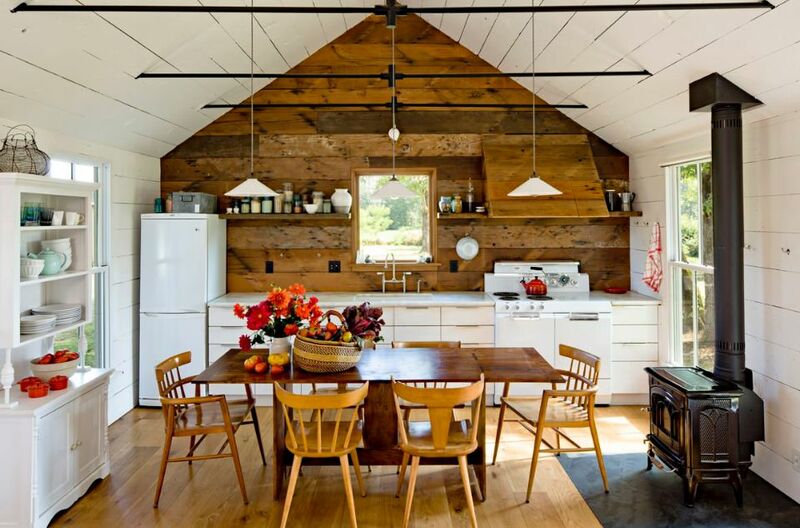 Reclaimed timber and barn wood are used in a variety of forms, giving the spaces a lot of character. 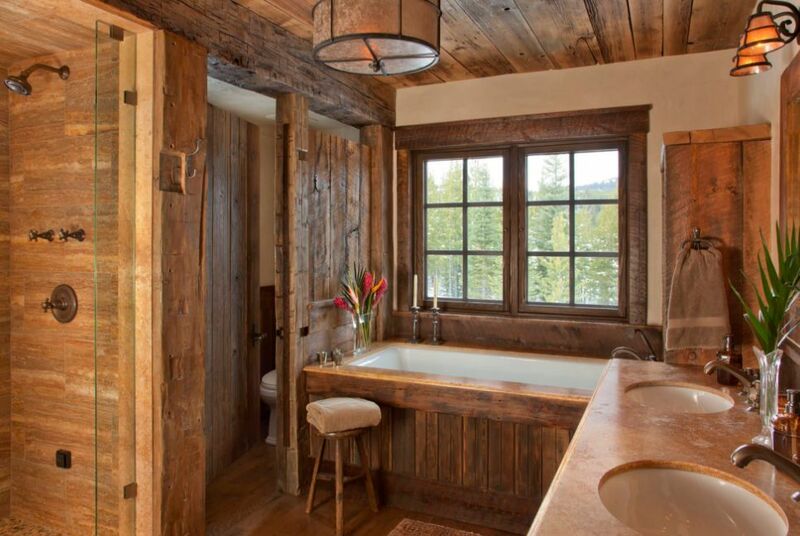 Of course, rustic interiors aren’t the only ones that are able to make wood walls look charming. 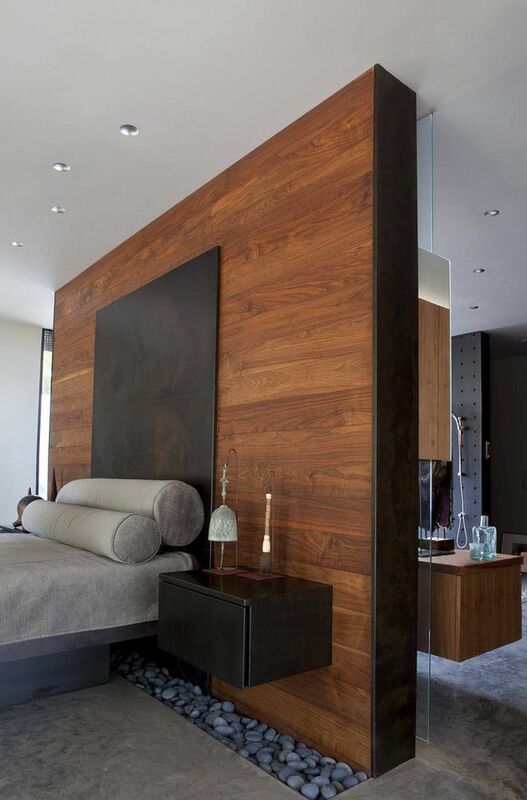 Although it’s not that common, wood-paneled walls can also look awesome in modern and contemporary spaces. 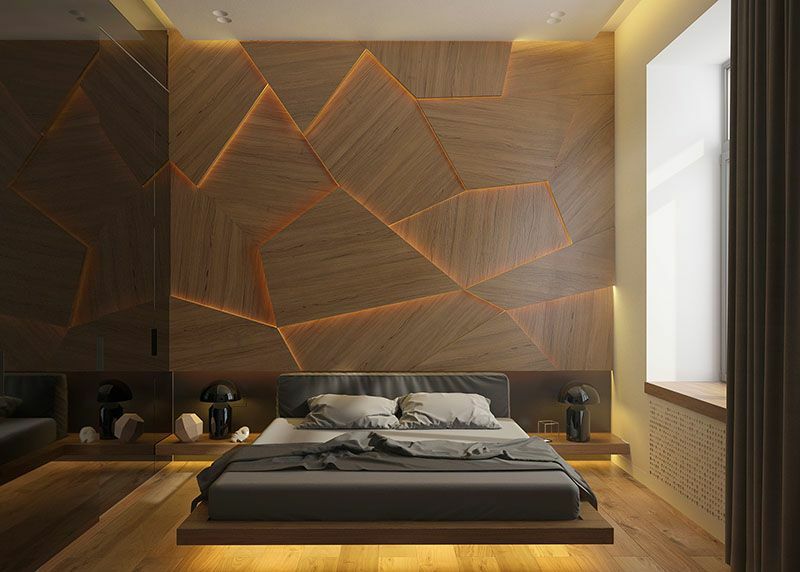 One example is a villa in Nantong, China which features a children’s bedroom with a unique wrap-around wood accent wall with built-in lighting. 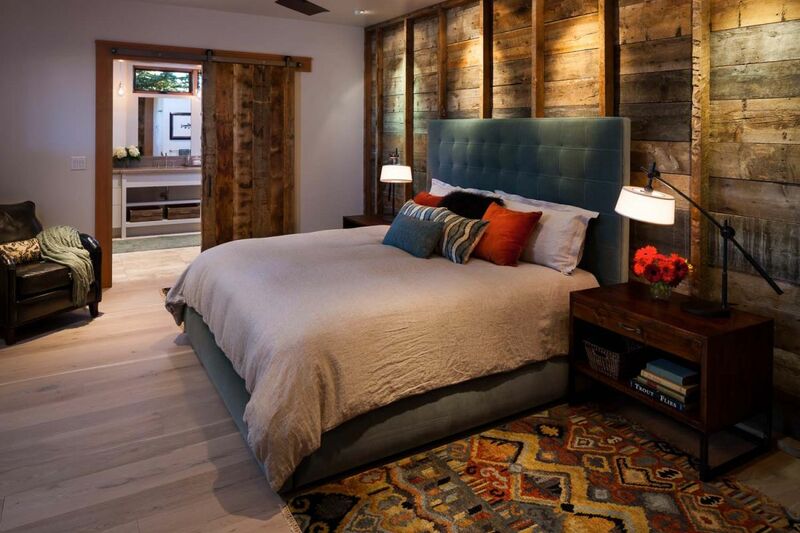 The wood covers the wall and part of the ceiling and creates a nice backdrop for the bed. 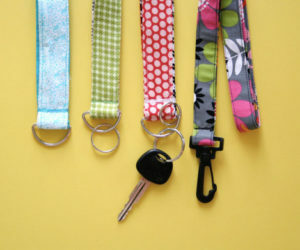 It was all done by PRISM Design. A somewhat similar design strategy was used by OM Architecture for the bedroom of this modern residence in Kiev, Ukraine. 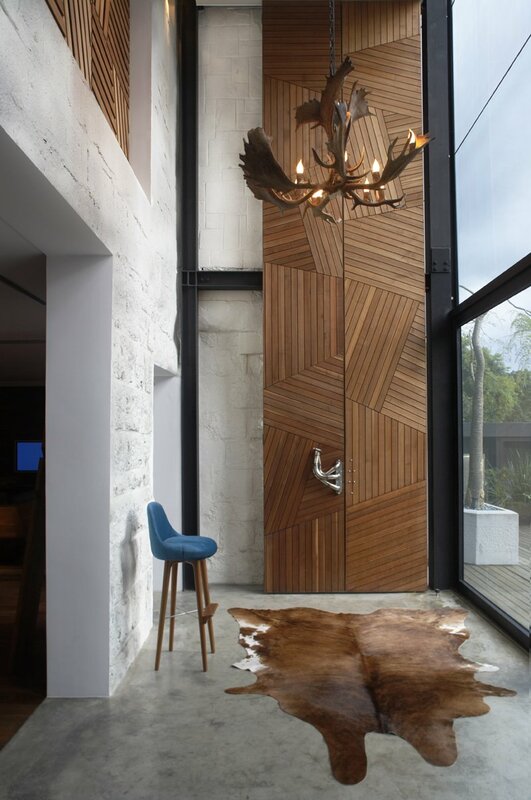 The idea here was to create an interior decor reminiscent of a chalet and in order to achieve that the designers incorporates a wood wall feature in the master bedroom. 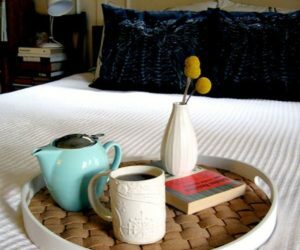 The structure actually covers a section of floor and the wall and serves as a sort of frame for the bed (platform and headboard). 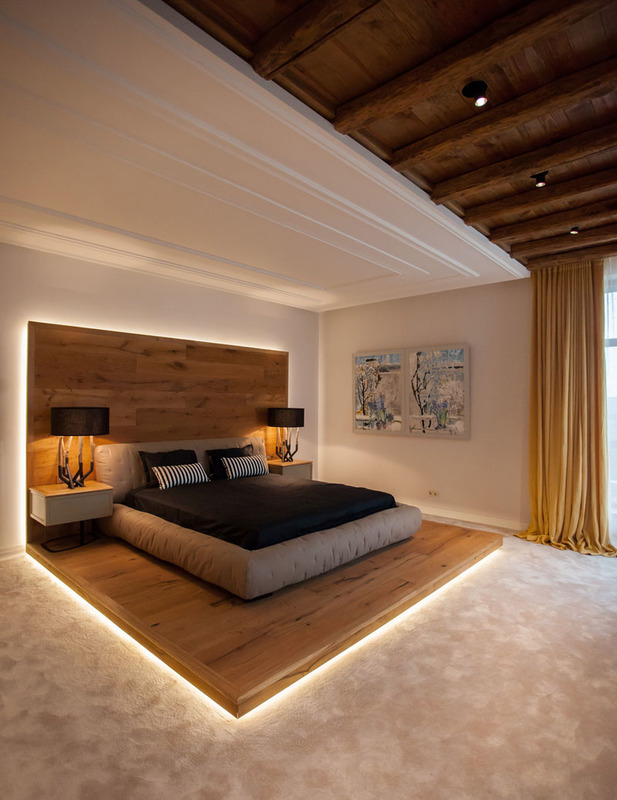 Wood walls look great when you highlight them with LED lights. You can see that in the design created by Archiplastica for this stylish and modern bedroom. The geometric accent wall is the centerpiece of the entire space. 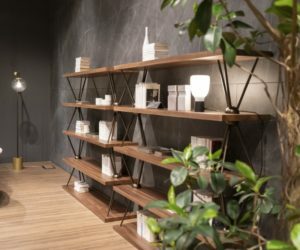 It’s covered in wood panels with various different shapes and proportions and the lines between them are visible thanks to the hidden LED lighting system. 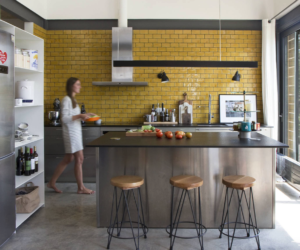 When remodeling an apartment in Montreal, designer Anne Sophie Goneau was challenged by the existing structure and appearance of the space so the decision to demolish some of the structures was made. 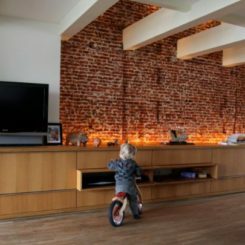 This helped to expose the brick walls and steel elements which was exactly what the designer wanted. 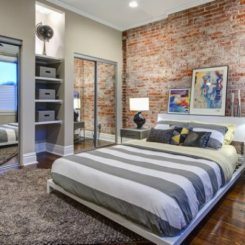 This helped to revive the original architecture of the 1887 building and to give the apartment an authentic but at the same time modern look. 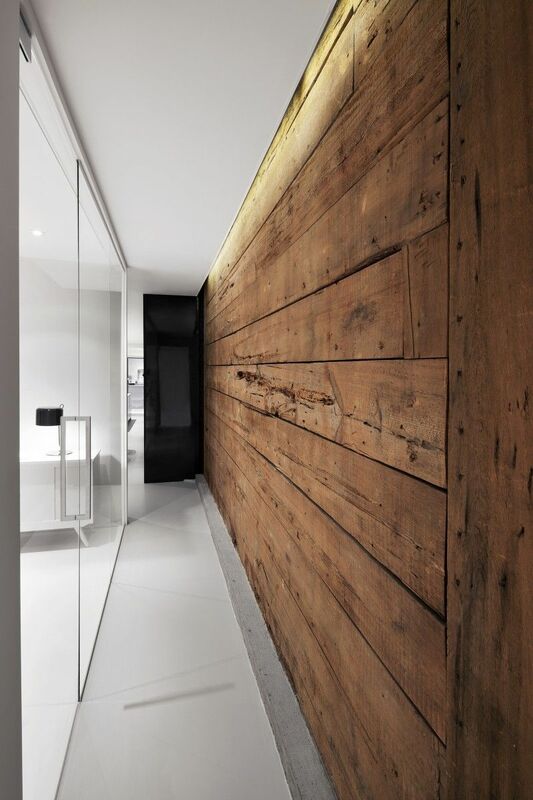 Wood walls such as this one were introduced as a way to balance out the raw concrete, steel and the white surfaces. The Ant Farm House definitely has an unusual name. 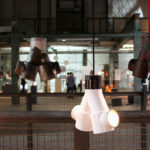 The inspiration for that came from the new organization and proportions of the spaces. Xrange Architects were faced with the challenge of preserving an already existing house made of indigenous stone and in order to do that while also updating the property, they built a new layer of 80 cm by 177 cm spaces around the structure and basically created a house around the house. 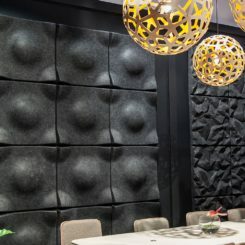 The new interior thus features a set of small and narrow vertical spaces which are reminiscent of the pathways in an ant colony, hence the name. 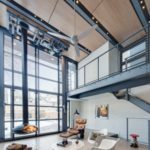 Instead of trying to conceal the narrowness and unusual height of these spaces, the architects chose to highlight them with cool design features such as this wood wall. A particularly cool use of wood on walls and ceilings can be seen in the design of the Ahmanson Founders Room which is a space situated on the first level of subterranean parking at The Music Center in LA. It was designed by Belzberg Architects and the main goal of the project was to create a warm and relaxing space linked to the communal areas of the music center on event nights. 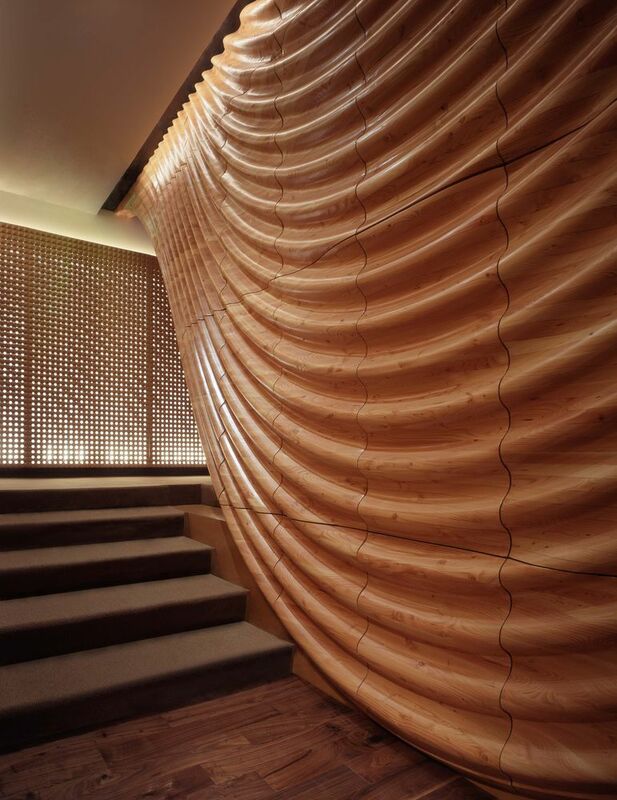 The architects used douglas fir lumber and fiberboard to create the sculptural wall and ceiling panels and created perforated patterns which give the space a refined look. 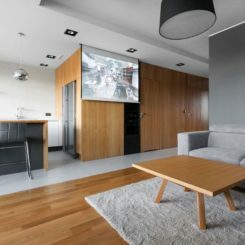 While some of the projects presented so far are definitely impressive, dramatic even, our goal is not suggest that you have to go all out when using wood in interior design. 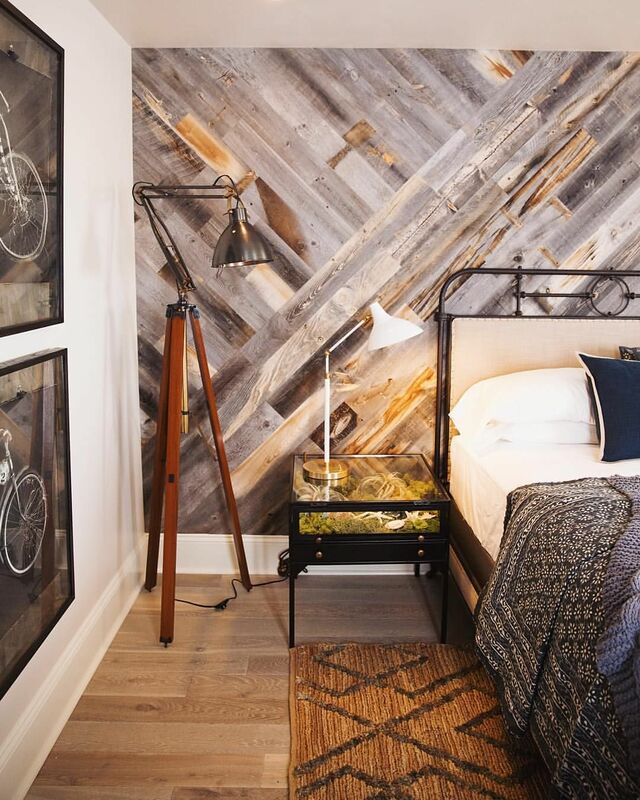 That being said, check out how simple and charming this wood accent wall created by AMW Design Studio is. 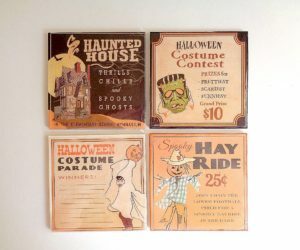 We love the way it’s decorated with framed artwork and with decorative items. 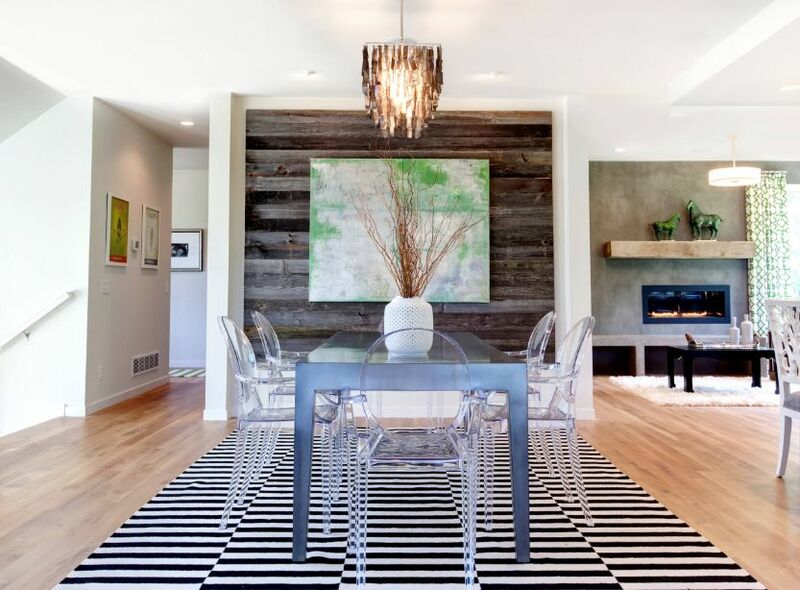 There are lots of different settings in which you can count on a wood accent wall to create a pleasant and welcoming mood and the dining room is one of them, as proven by this chic contemporary decor created by Amek. 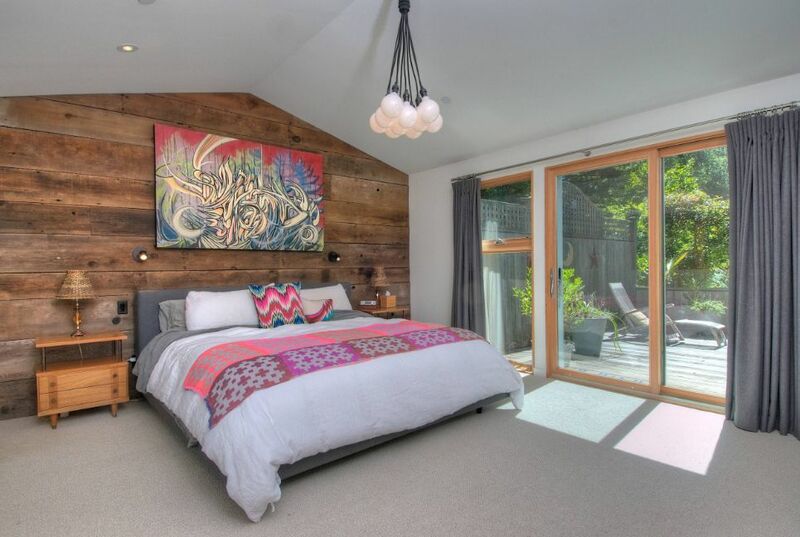 The wood-paneled accent wall contrasts beautifully with the artwork displayed on it but also with the striped rug and the light wooden flooring. 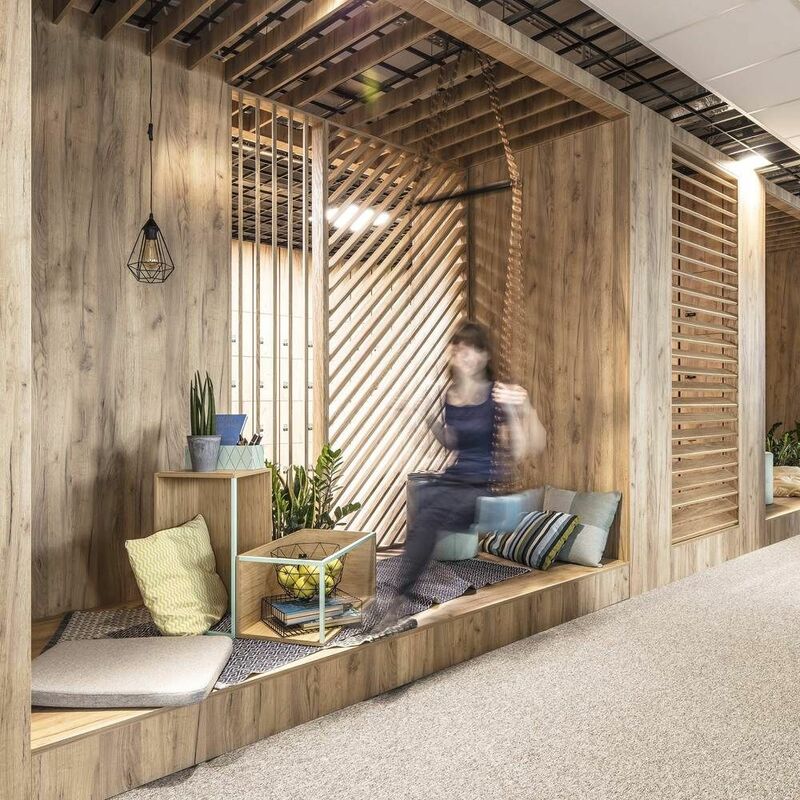 A lot of office spaces nowadays are focused on creating a comfortable and welcoming working environment for the employees and that often translates into friendly, cheerful, cozy and fun design strategies. 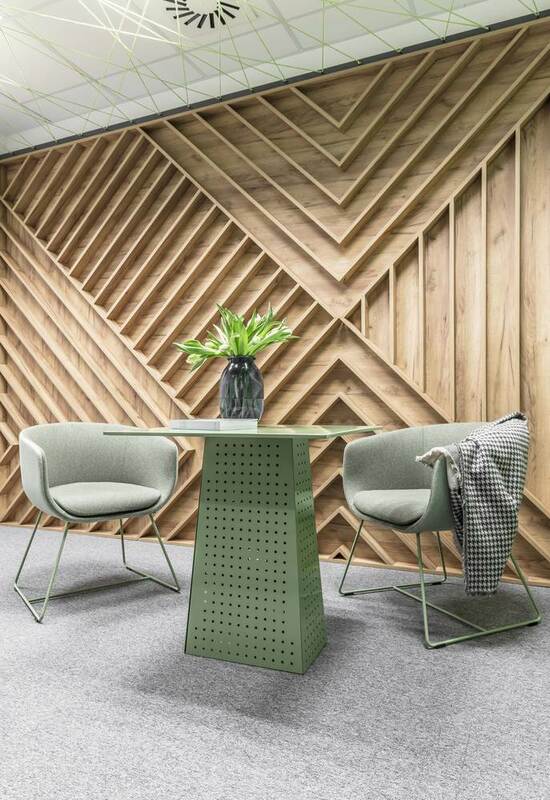 The architects at Metaforma Group designed one such space in Poznan, Poland. 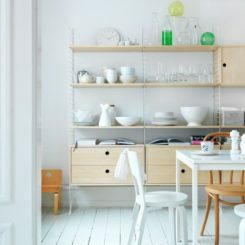 The interior that they created is dominated by warm wood accents, pastel colors and natural textures and finishes. Consider its name, the Heavy Metal residence has a surprisingly warm and cozy interior. 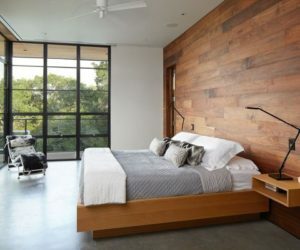 The wood wall in the bedroom is a great example that supports this observation. The residence is located in Joplin, US and was designed by Hufft Projects. The name is derived from the fact that the house features a strong industrial aesthetic, having an exterior wrapped in perforated steel panels. 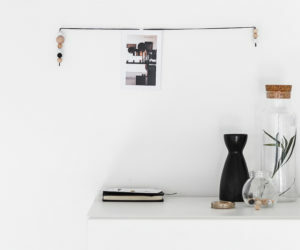 If you like the look of wood on walls but you’re not that thrilled about the idea of an actual wood wall, there’s a trick you can use. 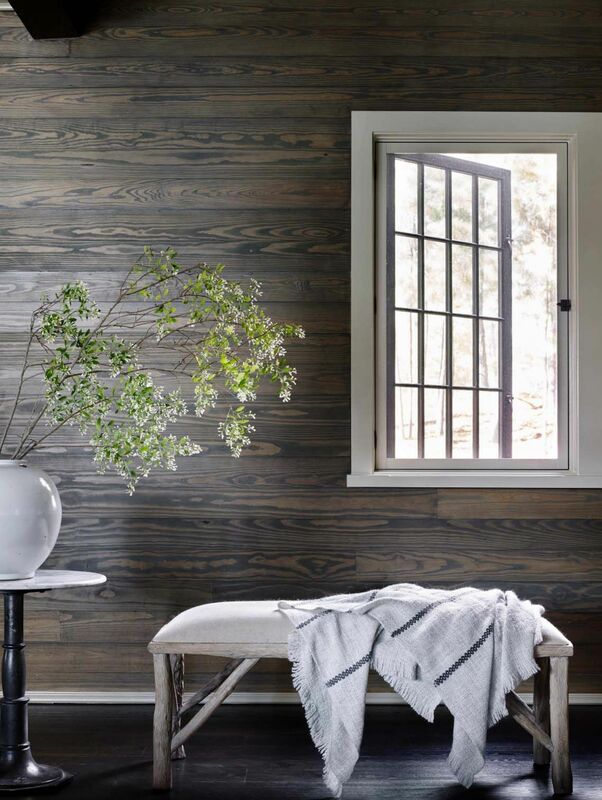 We’re talking about wallpaper or peel-and-stick wall decals that mimic the look of wood. 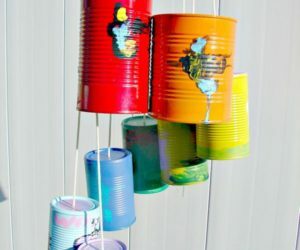 The idea comes from momtastic and you can see here how such an accent wall could look like. This cool patchwork wall and the entire room for that matter were a DIY project done on a budget. 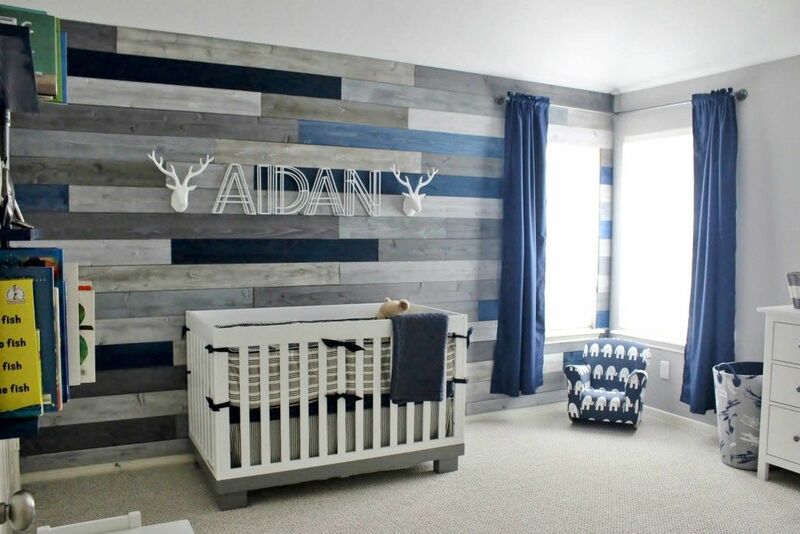 The wood wall panels come from pallets and were painted in various shades of gray, blue and black to match the overall color theme of the room. 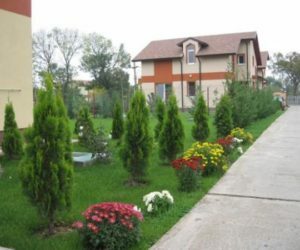 Find out more about the project on Projectnursery. 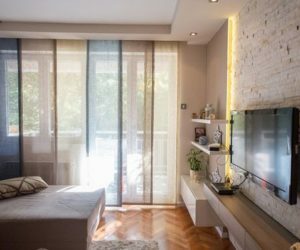 It’s important for the wood wall to fit naturally and beautifully into the context of the room because otherwise it stands out and not in a good way. 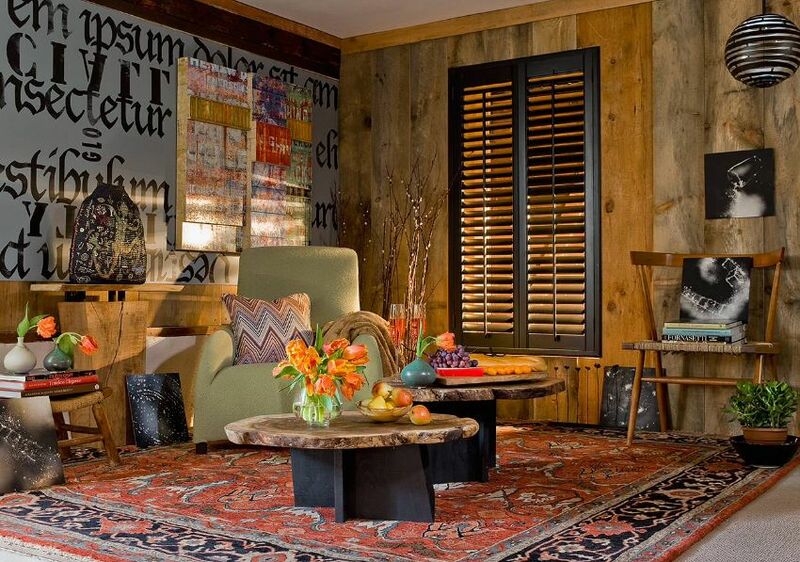 Perhaps you could find inspiration in this eclectic living room decor designed by Ana Donohue Interiors. The decor is quite busy and there are a lot of pattens and color accents spread throughout the room and everything comes together nicely within the shell of the wood paneled walls. But what about modern and contemporary interiors? 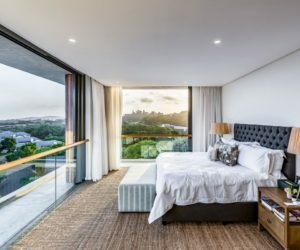 You’ve already seen a few examples of how a wood accent wall can fit into such a setting and we have a few more than we want to share with you, including this lovely bedroom which has a wonderful view of the tree canopies. 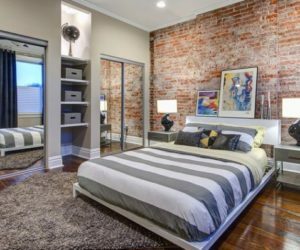 The accent wall helps to ground the decor and to establish a visual connection between the bedroom’s interior and the outside world. 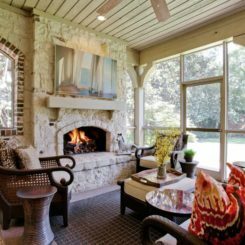 This design was done by Cornerstone Architects. 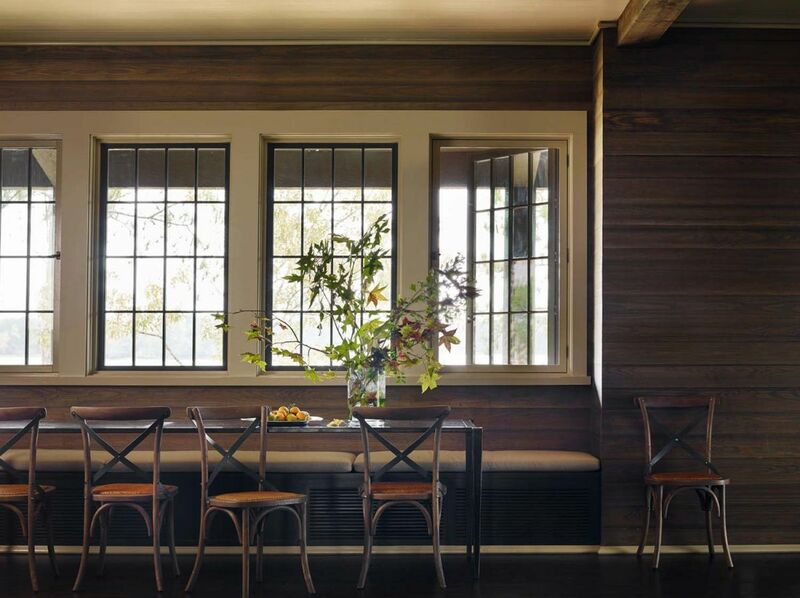 In the case of this social area designed by Simmons & Co It seems as if the furniture disappears into the walls and the floor, forming a cozy wooden shell. 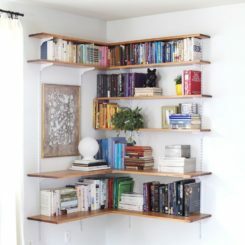 That mostly has to do with the fact that wood was used for all these surfaces. Although there are some differences between the wood paneled walls and everything else made of wood, they’re small and insignificant. 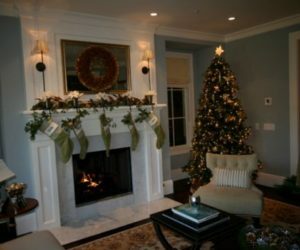 Sometime’s it’s ok to limit the use of wood on a single portion of a wall like the surround of a traditional fireplace. 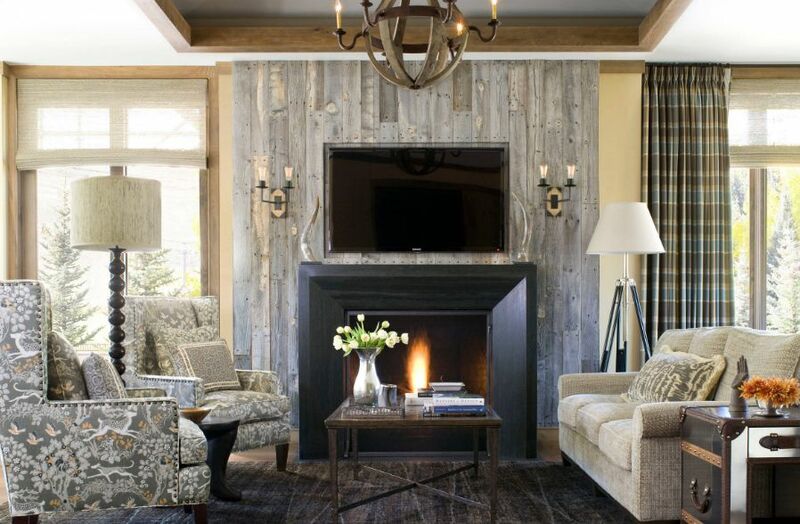 This strategy was used in this living room by Bardes Interiors and the result is quite charming. 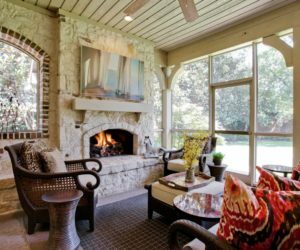 The wood coloring is nice and a bit neutral, the sconces are small and delicate and the fireplace has a pretty simple frame. 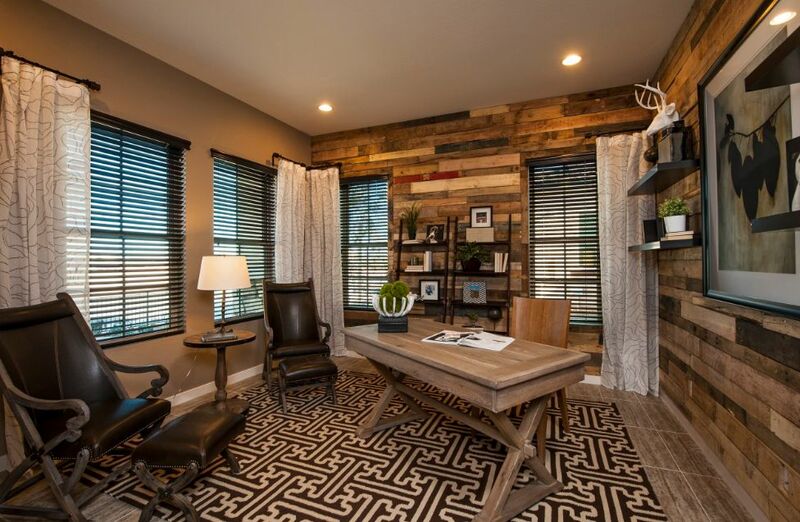 In this home office the use of wood on walls helps to create a pleasant and comfortable ambiance without making the space feel small and claustrophobic. The large windows definitely help with that as well. The overall color palette revolves around shades of brown and the lighting is really cozy too. 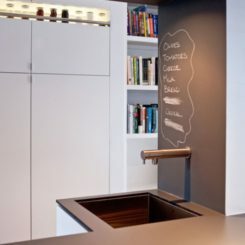 A nice design strategy can also be to introduce a wood accent wall into the kitchen. In this particular case, interior designer Jessica Helgerson managed to also use the accent wall to highlight the pitch of the roof and to create a strong but pleasant contrast between the wall and the elements surrounding it, furniture included. 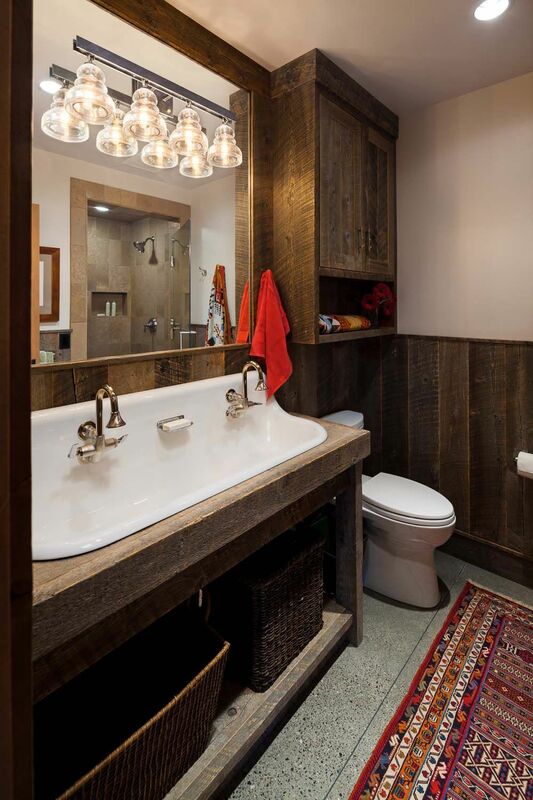 Wood is not generally among the materials commonly used in bathrooms. 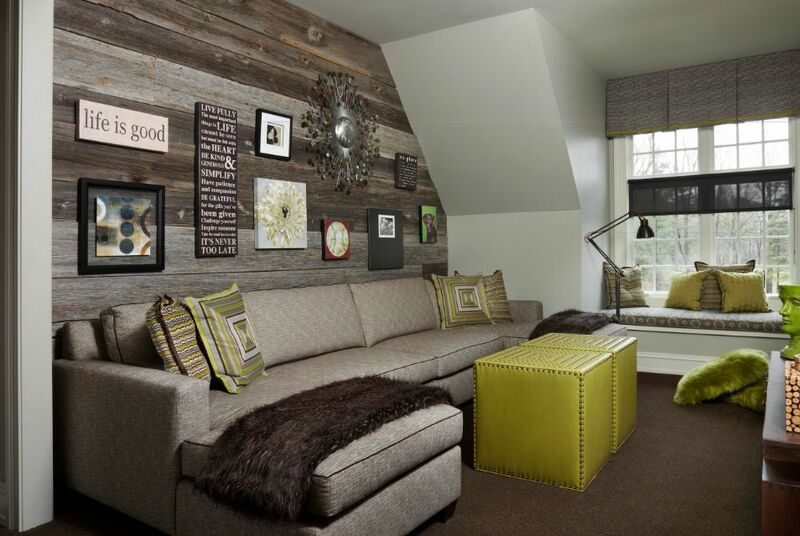 That, however, doesn’t mean you can’t add a wood accent wall to such a space. 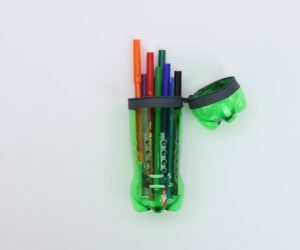 In fact, such a design feature would really stand out in a cool and interesting way. Curious how that would turn out. 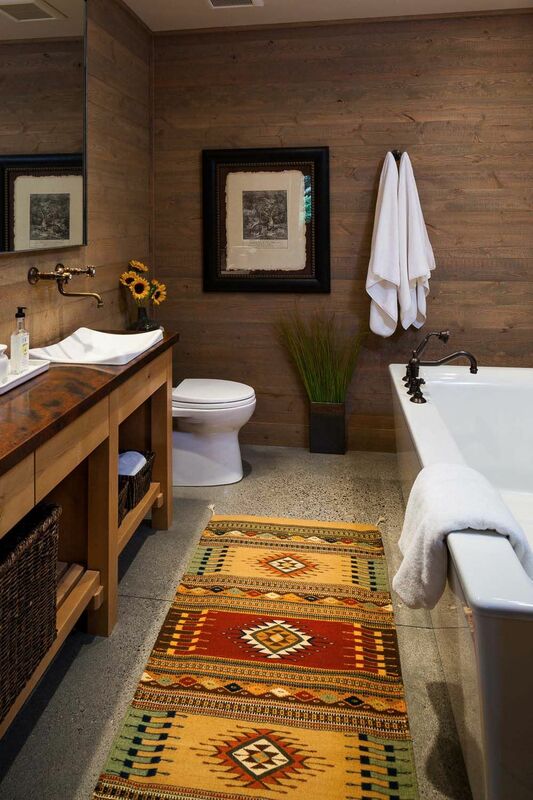 Check out this rustic bathroom created by Pearson Design Group. 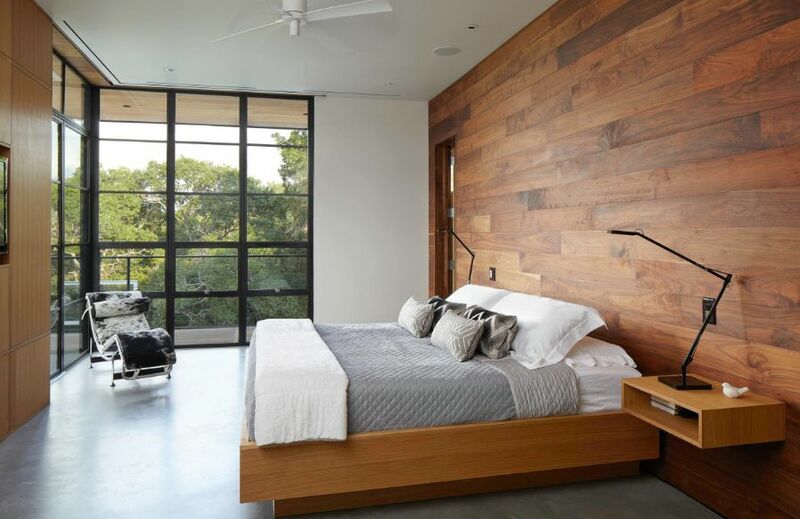 Another interesting strategy can be to use wood extensively on more than just one accent wall. That wouldn’t necessarily turn out so great if the room is small but check out this open living room designed by Nguyen Architects. 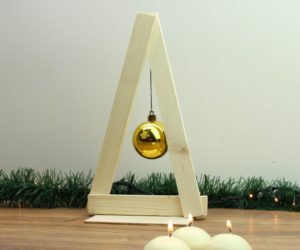 It’s practically wrapped in wood and it looks amazing. At the end of the day, it’s best to balance warmth and coziness with freshness and openness and that’s exactly what this mid-century bedroom does with its design. The subtle pitch of the ceiling, the wood paneled accent wall, the neutral gray floor, those large windows and sliding doors and the funky accent colors all contribute to an overall stylish and very chic decor and a very pleasant ambiance.